Barons Quay is now ready to welcome even more visitors who will have the advantage of being able to arrive in style. 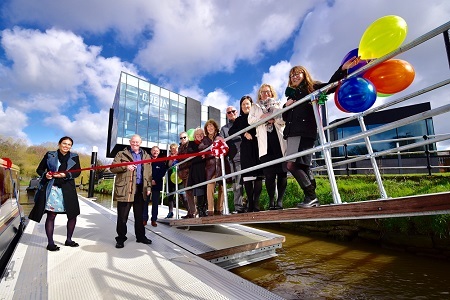 Barons Quay will now be a popular boating destination, thanks to new mooring pontoons installed by Cheshire West and Chester Council and the Canal & River Trust charity. The moorings were officially opened on 11 March with a launch event. 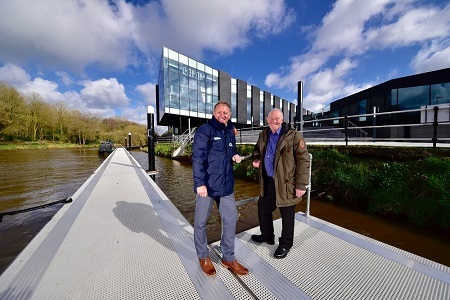 They have been constructed on the River Weaver, next to the Odeon Cinema, in a joint project to encourage visiting boaters to stay right in the heart of the leisure development, adding vibrancy and colour to the town centre. The £175,000 funding for the two pontoons came from Cheshire West and Chester Council. Councillor Brian Clarke, Cabinet Member for Economic Development and Infrastructure, said: “This is the latest addition to Barons Quay and part of our ongoing development plans for Northwich. “Visitors arriving by boat will now have direct access to all of the town’s shops, restaurants and bars. Mooring at the front door of the Odeon has to be the most stylish way to visit the cinema. The boats are free to moor for up to 24 hours. The Trust, which cares for 2,000 miles of canals and rivers, installed the pontoons, which are 92 metres long and provide mooring space for up to four boats. Duncan Davenport, Customer Operations Manager with the Canal & River Trust, added: “Every year we welcome thousands of boaters to Cheshire’s waterways and it’s great we’re helping to turn Northwich into a boating hotspot. Added to other local waterside visitor attractions, Anderton Boat Lift and the Lion Salt Works, the new visitor moorings give another compelling reason for visiting the area. For more information about visiting Northwich and Cheshire’s waterways or becoming a Friend of the Canal & River Trust, go online at www.canalrivertrust.org.uk or phone 0303 040 4040.